Click here to read a Free Chapter! 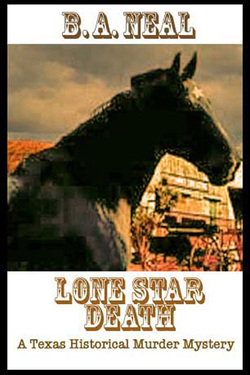 "Lone Star Death is a delightful mystery that is sprinkled with the right amount of historical information and filled with colorful and unusual characters. The author has done a great job creating a small town mystery that is filled with unusual twists and turns and a great surprise ending. ...There is also a touch of romance. Highly recommended to cozy and historical mystery lovers---and anyone who just loves to follow a strong heroine as she figures out who done it and why." Reviewed by Marilyn Meredith, author of the Deputy Tempe Crabtree mysteries and the Rocky Bluff P.D. series.